Students from Gunning Bedford Middle School recently launched their work to analyze local water quality through the EarthEcho Water Challenge. As recipients of an EarthEcho Water Challenge test kit donation, students were equipped with the tools needed to collect critical water quality data while learning about their local waterways. Students began their work by learning more about water quality and the testing process in the classroom, running a trial test on a sample of water collected from Red Clay Creek located in Wilmington, DE. 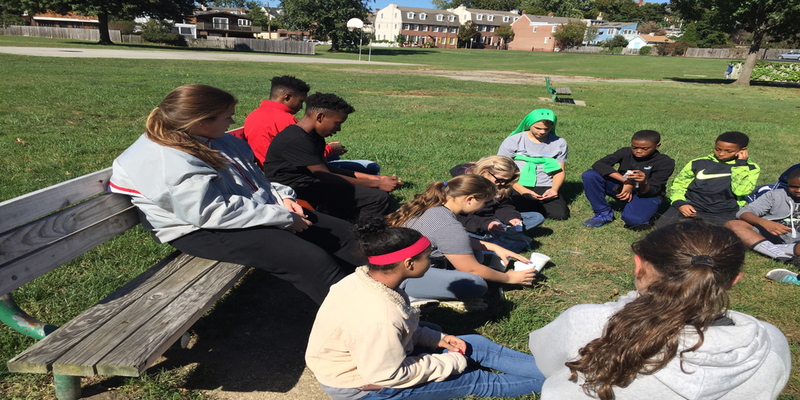 After becoming comfortable with the water testing procedures the class followed up with a field trip to a local waterfront park where they had the opportunity to test the water at the Delaware River-Delaware Bay meeting point in New Castle, DE. Through their testing they were able to compare water quality data from different portions of the river, noting variations in dissolved oxygen between two sites sampled. Students logged their water quality data in the EarthEcho Water Challenge database, and took part in a beach cleanup to further take action to protect their local waterways. These students will return to their test site in the spring of 2018 to take additional water quality measurements. Thanks to the students and staff from Gunning Bedford Middle School for their participation in the EarthEcho Water Challenge and commitment to protecting their local waterways. Interested in applying for an EarthEcho Water Challenge Test Kit Donation for your class? Learn more and apply here.